As a newcomer to the Ultraman universe, figuring out who’s who and what their story is can be daunting. There’s nearly fifty years of Ultraman history out there, with dozens of shows and a few reboots that feature the same characters, confusing everything even further. Nonetheless, I’ll do my best to introduce the subject of this review, Ace Killer. Ace Killer is kind of like the Amazo of the Ultraman universe. He’s a robot who was built by the evil Yapool, a kind of Satan-like figure, as an evil counterpart to Ultraman Ace, the eponymous hero of the fifth Ultraman series that aired from 1972-1973. Though given the name “Ace Killer,” he didn’t actually kill Ultraman Ace, and though powerful, he was eventually beaten as usual. He later reappeared over twenty years later in the show Ultraman Mebius, where he was known as “Mebius Killer." He's often fought multiple Ultramen, and like Amazo, one of his key abilities is to absorb his enemies' powers and use it against them. If you’re interested in learning more, you can check out Ace Killer’s page on the Ultraman wiki. 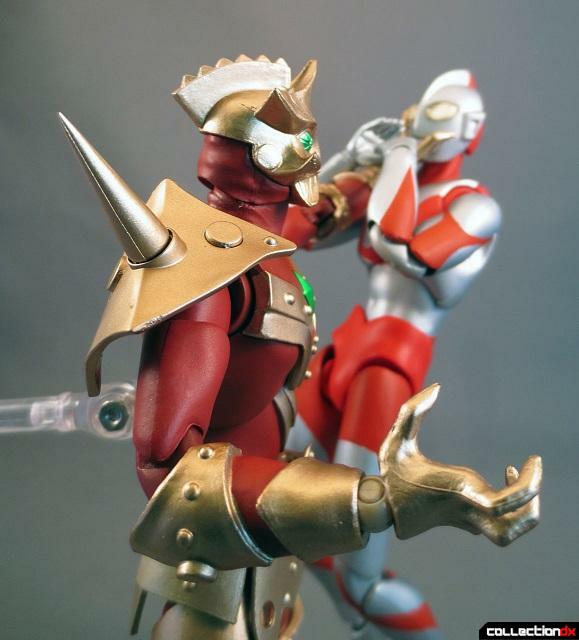 I don't actually own Ultraman Ace himself. 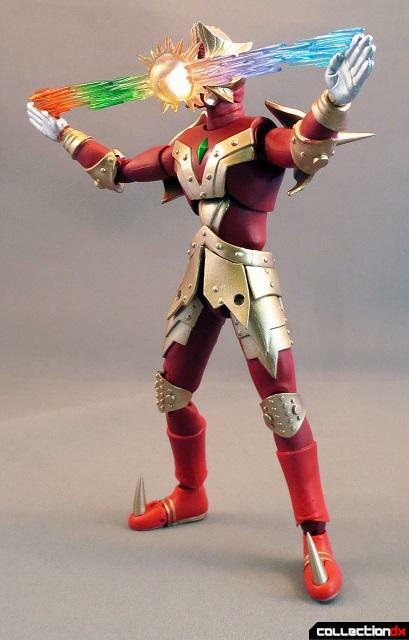 I'm trying not to get too deeply involved in collecting the Ultra-Act line, but when given the opportunity to review this figure sample courtesy of Angolz.com I gladly took it. 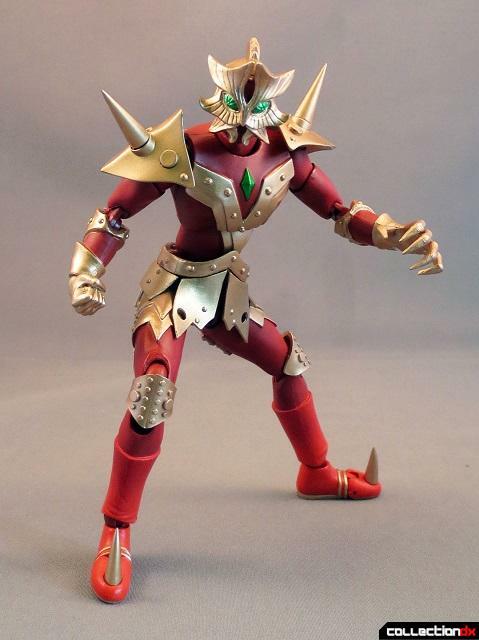 Tamashii Nations' six-inch-scale Ultra-Act line doesn't have very many villains in it, making Ace Killer that much more appealing. As mentioned, the figure is in roughly a six-inch scale (although in "real life" the character stands 130 feet tall). 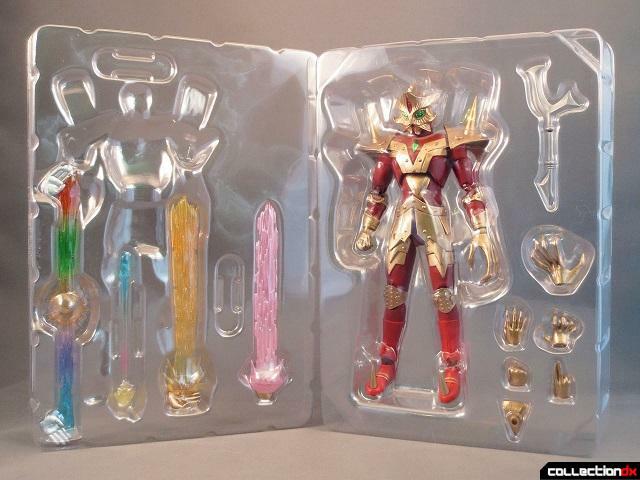 He comes in an attractive, bright red package that makes the mistake of hiding the figure itself a bit too much. Once open, Ace Killer sits in a few very firm plastic trays, along with a plethora of accessories. If you can figure out how to put the figure and all of its accessories back in the trays, you can fit the trays back into the box for storage. Ace Killer's sculpt isn't too detailed, but it doesn't have to be. While some Japanese tokusatsu figures are sculpted so that you can tell it's a figure of a man in a suit, Ultra-Act focuses on sculpts that assume the character is "real." Unlike some other Ultra-characters, Ace Killer's outfit hasn't changed much over the years and through various incarnations, so the design is more or less accurate (I say this with qualifications because it's possible a diehard Ultra-fan could correct me on some minor aspects of the suit). The "skirt" is made from pliable material, and limits the hip articulation somewhat, although not too much. If you've never handled an Ultra-Act figure, you should be aware they tend to feel very loose and gangly. 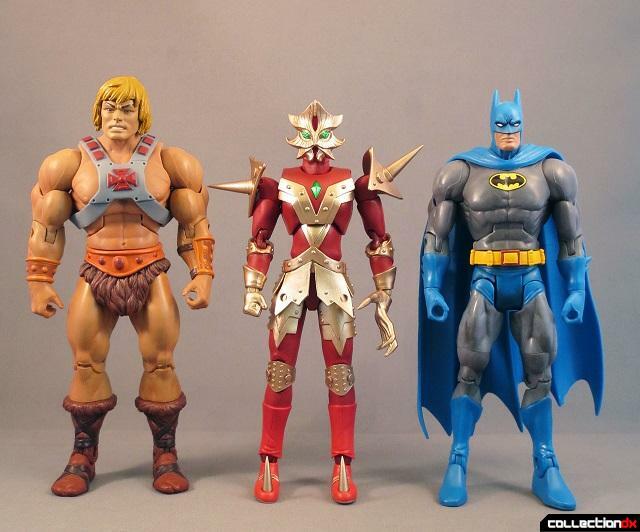 They're sort of like ToyBiz's most articulated Marvel Legends figures, but with an even greater tendency toward loose joints. The shoulders and hips can be particularly tricky. Getting Ace Killer to stand up without using a display stand is difficult and sometimes requires the use of a stand (here I used a Tamashii Stage Act stand). But that's the tradeoff for a ton of articulation. I'm not even sure I could list all of it, but he's got ball joints at the head, shoulders, wrists, abdomen, waist, hips, and ankles, double-hinges at the elbows and knees, biceps swivels, and more. The shoulder articulation is basically double-ball and allows for a lot of movement, though some poses are a bit restricted by the shoulder armor. Then there are the accessories. I think I've got the correct names for them all. Above, you can see the M87 beam. All of Ace Killer's special attacks are swiped from other Ultraman characters (again, much like Amazo). This one comes from Ultraman Zoffy. There's also the Emelium Ray, swiped from Ultraseven. 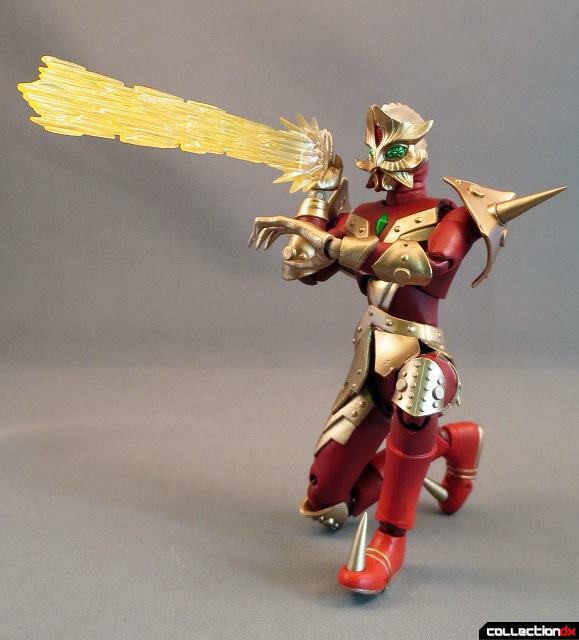 The Specium Ray, which he can use after absorbing Ultraman's energy. He also comes with his own weapon, the sai seen in one of the photos at the top of the review. (I know it doesn't look like, say, Raphael the Ninja Turtle's sai, but that's what it's referred to as on Ace Killer's Ultra-wiki page so that's what I'm going with.) The tsukagashira (pommel) at the end of the sai pops off so that you can fit it into the gripping hand, then put the tsukagashira back on. He also comes with a bunch of optional hands and a swappable plate for his back so that you can plug him into a Tamashii Stage Act stand. Be careful with those plates, they're very easy to lose. While some of his joints are a little loose, Ace Killer is a great action figure with a ton of accessories. As an import figure he'll set you back at least $40 and probably more as he becomes harder to find. If you want one, I recommend picking it up sooner rather than later. 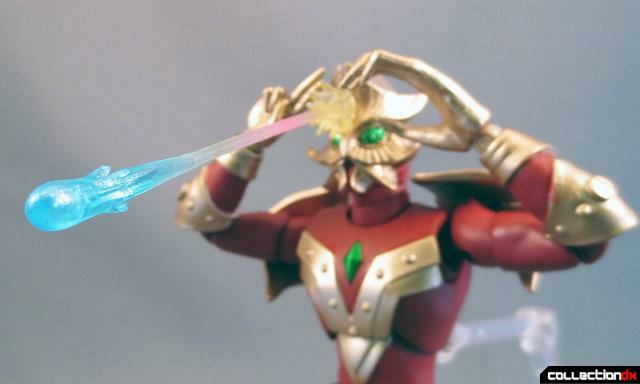 Tamashii does occasionally reissue Ultra-Act figures, but so far they have yet to reissue any but the most popular characters like Ultraman and Zoffy - and they've never reissued a bad guy. For more great reviews as well as toy news and other fun stuff, be sure to check out Poe Ghostal's Points of Articulation! Oh no! The invasion has begun! 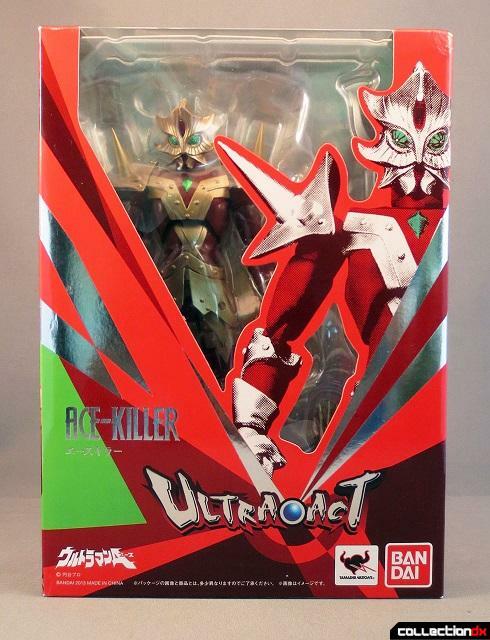 I haven't cracked open my Ace Killer yet but I'm glad he got the Ultra-Act treatment. He always intrigued me with his creepy look and pictures (pre-YouTube) I saw of the Ultra Brothers crucifixion.